Aisha recently participated in the EdgeFunders Alliance conference on reorganizing power. “At the recent Edgefunders Alliance conference held in Barcelona, Spain, members and participants continuously discussed the need to democratize things. Democratize economies. Democratize to bring back the commons. Democratize philanthropy shifting and redistributing resources to the Global South and Global Movements. If this is the case, then a paradigm shift is necessary. Democratizing philanthropy must lead to total community control of all the resources towards a #justtransition. In order to ensure that we #reOrganizepower, a community philanthropy based approach is the right tool. The question is whether the funders, and perhaps even the movement leaders, are ready to revolutionize the power dynamics”. Dalia Association, in collaboration with El Beir Arts and Seeds, and Singer Café organized “Al Saha”; an initiative to create social gathering spaces for Palestinian civil society. Public spaces are becoming rare in Palestine, due to the extensive land confiscation from the Israeli Occupation, and the privatization of spaces. In order to have a strong and accountable civil society in Palestine, we need to create public spaces to share and exchange knowledge and set priorities for our own durable development. 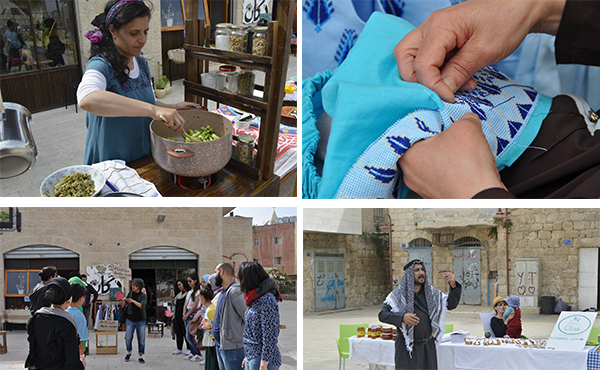 The activity took place in the old town of Beit Sahur. Al Saha embodies Dalia’s belief in our right as Palestinians to control our own local resources for a durable development. Local vendors, craft workers, clothes designers and musicians were invited to sell their products. The event included several “corners” such as the permasolutions corner, and a storytelling corner. In the permasolutions, Mohammad Saleh and Ala’ Hilu showed us how to build a rocket stove. In the storytelling corner, we heard tales from the land in Palestine and its people. Vivien Sansour cooked a great seasonal Palestinian meal from fava beans. “When we eat local seasonal food, we respect the environment because we respect our soil and our local seeds, and this is part of the beauty of our culture". Singer Café also served drinks and delicious sandwiches for the visitors. We also had a non-cash alternative market to exchange resources, skills and expertise among the visitors in order to raise awareness on the value of these resources in achieving local and durable development. On the 1st of April, Dalia celebrated its 10 year anniversary. 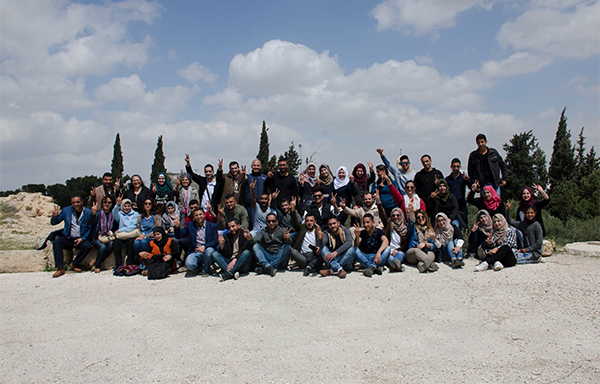 Team Dalia organized a trip inviting its friends and supporters, to the South of the West Bank in order to visit the local communities that we work with through our community programs. The first stop took place in the town of Tuqu’ in the governorate of Bethlehem. Through the Village Decides program, the community is implementing two initiatives. The first, led by the youth entrepreneurs group, where they are tackling issues related to youth involvement and representation in the cultural scene of Tuqu’; raising awareness on environment and cultural heritage; and capacity building and empowerment of youth to decide on their future careers. The second initiative led by Al Ghad for people with disabilities, is supporting families of disabled people in generating income for the group and providing more services and support to disabled people. The villagers also established a village community fund with the help of Dalia, where they will contribute with their resources to address their needs and priorities. At the second stop, we visited the women groups in Susya village South of Hebron. The women shared with us their initiatives as part of the Women Supporting Women program, where they are going to use wool to produce natural yarn. 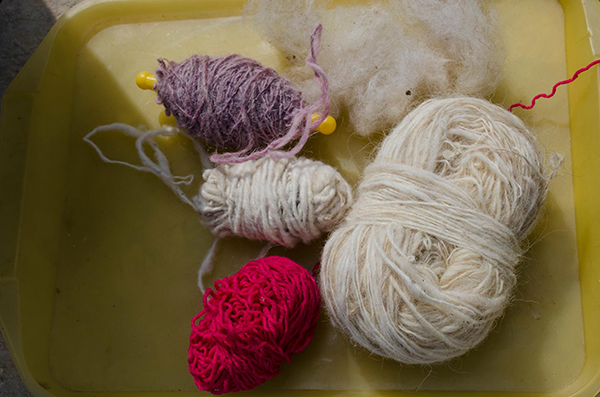 They also showed us samples of their work with the wool. This initiative will serve the women of the South of Hebron in the areas of Al Mufaqara, Al Tawane, Susya and Um El Kheir, as it will create job opportunities and generate income for the women. Later, the visitors took a short tour to learn about the village. 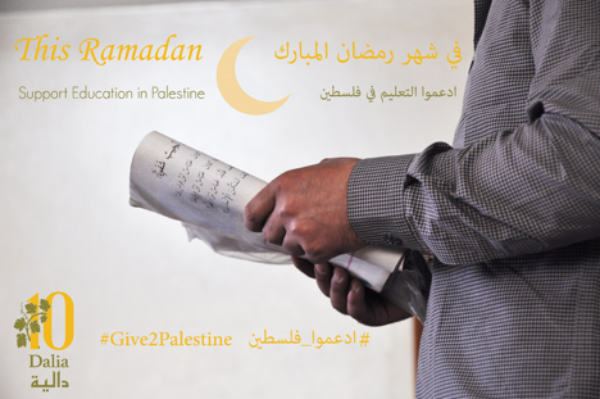 On this day, Dalia launched its first edition of “Global Giving Day for Palestine”, an initiative by Dalia, that supports Palestinian community based organizations and the civil society in general. This is being done through a peer-to-peer fundraising platform https://dalia.networkforgood.com/, and will occur every year. This platform allows Palestine supporters and Palestinian Diaspora to support Palestinian civil society in all its categories. Dalia hopes that through this platform, we will decrease our dependence on external resources to achieve our own durable development. In the last couple of months, the youth’s initiatives from Saffa, Mazari’ Al Noubani, Jiftlek and Fasayil, were supported by mentoring in technical assistance and business planning. They are in the final stages for launching their initiatives. In April, we visited Saffa and Mazari' Al Noubani, with representatives from our local donor: Palestine For Development Fund. In Saffa, we visited the Murooj community garden and the Ibda' Cafeteria, which is creating a public space for youth in the town to socialize and to host events to raise awareness on social, cultural and environmental issues, in addition to other community events. The materials used for both initiatives are designed and made by the youth themselves, from the available local resources. Then we stopped by Qurtaleh store in Mazari' Al Noubani, where they will sell products and craft-works made by local artists, and producers. They plan to sell these items online as well. Then we visited the Community Service center, which will ensure more accessible services for the locals. In Jerusalem, the youth presented eight initiatives and voted for four: Idhak Min Qalbak(Laugh from your Heart): a family event for entertainment and awareness raising on issues faced by Palestinians living in Jerusalem. Smart Pal: a search application for local Palestinian business. Mutalazimit Hub (Love Syndrome): an initiative to ensure inclusion of youth with Down Syndrome, and to build their capacity to produce crafts and art products for sale. Awditna (Our Return): to conduct activities to revive Palestinian culture and heritage in destroyed villages during the 1948 Nakba. The grants were awarded accordingly. The Kharbish Fankish girls group from the Orthodox School of Bethany in Al ‘Eizarya, organized a fun day for families and their children in Abu Dis. As for the Dance for Life group, Zumba classes were organized for the students. In Gaza, we launched the Ibda’ program in two areas: the north and the center part of the Strip. Trainings in local economy, creative thinking, local solutions, cash and non-cash resources, are taking place in both areas. We signed the grant agreements with the two women controlled initiatives in the south of Hebron including the wool project, and the agroecological project (community farm). Both groups are currently provided mentorship for business planning and budgeting for their initiatives. Al Zawyeh village fund are currently providing their community with the needed waste bins to facilitate the waste collection in their area, to minimize pollution in their village. 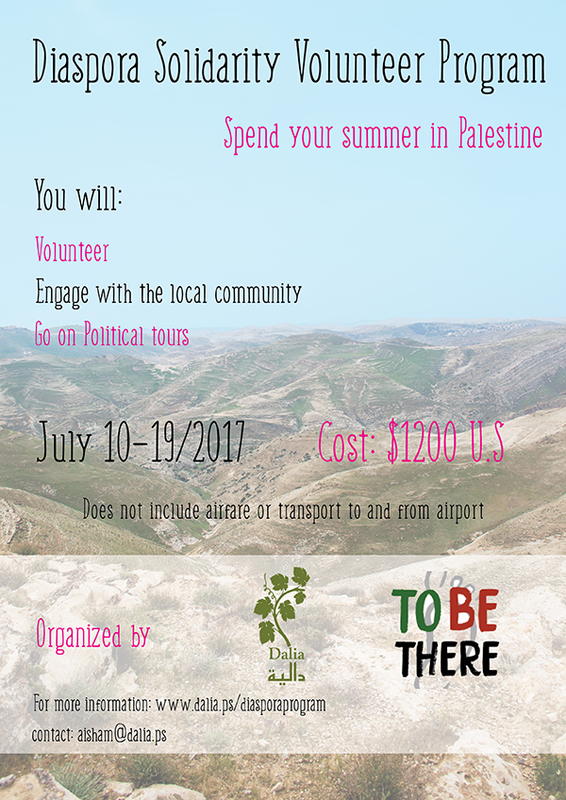 Join us this summer and volunteer in Palestine! Are you a Palestinian living in the Diaspora? Are you a friend in solidarity with Palestine? Are you eager to spend your summer in the homeland? Dalia Association, and To Be There, are very excited to announce our Diaspora Solidarity Volunteer Program! It will be implemented for the first time this summer, July 2017. The main component of this program focuses on volunteering and community service, as well as learning about the realities on the ground in Palestine. The program will comprise 10 days where the participants will learn about the political reality for Palestinians living under Occupation since 1948. In addition, volunteer workdays will be organized in various local communities and villages. This Ramadan, we will be featuring our newly established Esnad education fund on our peer-to-peer fundraising platform, https://dalia.networkforgood.com/. Stay tuned for more information. Spring is here! That means it's time for spring cleaning! You can donate your used items (in good condition) to Dukkan. Dukkan is Dalia’s effort to make effective use of the resources available in our country, and to decrease waste going to landfills, thus decreasing pollution. The shop also increases access of needed goods at a budget price, so that everyone in our community can purchase what they need. This generates a bit of income for the Dalia Association, and it will increase the number of our community-controlled grants, so that more people in our community can benefit from these grants, therefore decreasing our dependence on external resources.